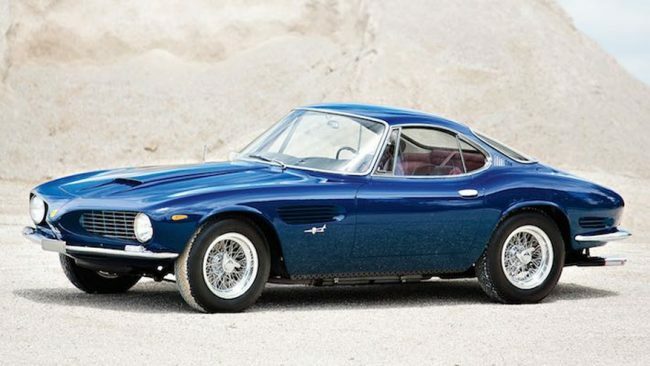 1962 Ferrari 250 SWB Berlinetta Speciale by Bertone Presale estimate: $14,000,000 – $16,000,000 Hagerty Price Guide: N/A The styling is a bit “love it or hate it,” but as a 250 GT SWB with a one-off body designed by Giorgetto Giugiaro at Bertone, and as a car that was the brainchild of Nuccio Bertone himself, the value and history are certainly there. The nose of the Bertone SWB was given the “sharknose” treatment reminiscent of the Ferrari Formula One cars that had just won the world championship, and the interior was more luxuriously appointed than the standard car. It has been in a private collection for the last 35 years, so this is a singular opportunity for a collector to acquire one of the most distinctive coach built Ferraris of them all. Coach builders Bertone & Pinin farina were great competitors of the post war era. Pinin Farina deigned many Ferraris for Marinello, but this 250 SWB was initially commissioned by Bertone for himself, choosing the young designer Giorgeto Giugiaro. Bertone became famous with the cars he designed for Fiat. Bertone also was a competitor in the famous races of the period such as the legendary Mille Miglia. Photo Brian Henniker. Info With thanks courtesy Gooding & Company’s 2015 Pebble Beach Auction. . Estimates Hagerty. Monterey Auctions AUGUST 15th / 16th 2015. ALAIN DELON’s FERRARI sold for €16,300,000 Certainly the most beautiful cabriolet of the second half of the 20th century. One of 37 California Spider SWBs with covered headlights. Completely original, never restored. Unique, fabulous history. Belonged to one of the most famous film stars, Alain Delon. Matching numbers. The 1961 Paris Motor Show California. Same owner since 1971.